VMworld is the real-life representation of the VMware ecosystem with all the latest technologies and being the hub of knowledge-sharing. It’s an event where you’ll witness what VMware has been doing for quite sometime and what it plans to do in the future. You’ll meet experts who get the idea and strategies across to you and you’ll also meet VMware partners and other vendors who have integrated their products with VMware. Amidst all these will be a few companies that showcase their products that deal with data protection and disaster recovery. We’ll be one of them. 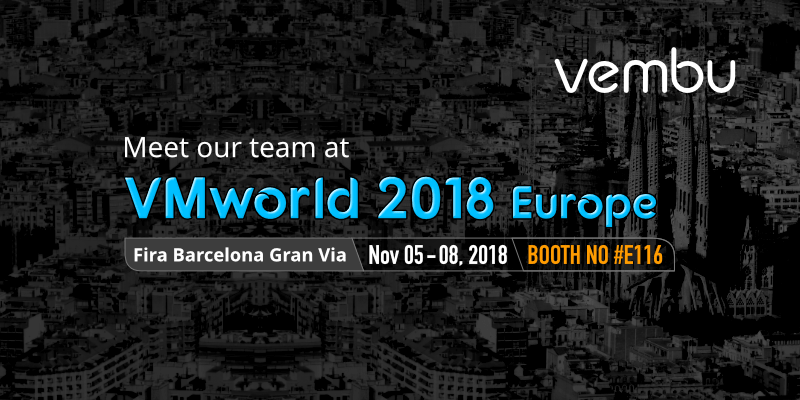 Vembu, after making an impact at VMworld US, is now all set to reach out to the thousands of other experts from different parts of the world at Barcelona. If you’re planning to be at VMworld, meet us at booth E116 at the Solution Exchange and see how your data protection complexities can be simplified with Vembu BDR Suite. Talk to our product experts and learn more about the must-have data protection plans that will save you during turbulent times. From instant recovery to setting up a offsite DR copy, work with Vembu BDR products or get a quick-demo. Along with what’s available now, you can also find what’s in store of our upcoming release, Vembu BDR Suite v4.0, that will be rolling out in a couple of weeks. Juggling between VMware sessions and The Kooks’ concert, certification workshops and arcade gaming, networking and partying, you might end up finding a product that could potentially save your business in the near-future.